George Foreman 'The Champ' 36" Grill. . . The grill that put the George Foreman Lean Mean Fat Reducing Grilling Machines on the map remains the number one selling grill worldwide. It combines fat reducing technology and contact grilling to cook food in half the time. 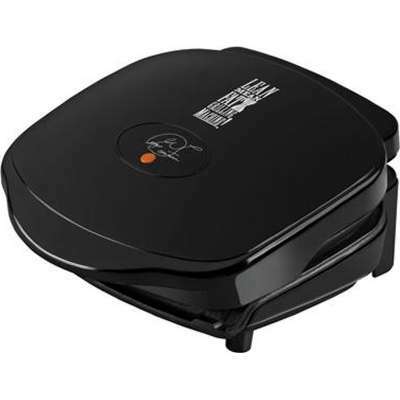 36 square inch grilling surface lets you cook for 2; Temperature indicator light indicates plates are at grilling temperature; Integrated handle is ergonomic & compact; Double non-stick coating is durable & eliminates need for oil; Patented sloped grill design knocks out the fat; 1-1/2" floating hinge works to accommodate thick cuts of meat. Embedded heat elements provide consistent heat & rapid recovery time; Fixed grill plates can be wiped down for easy clean up; 2 drip trays catch run off liquids for no-mess clean up; 2 spatulas are customized for grill.